The 2018 edition LITH cloisonné ornament is in production. This year's festive logo was designed by Jacob Gonzales, a student in Hogg Middle School's graphic design program. We've added a second cloisonné ornament this year with the highly recognizable trademarked LITH bulb logo. The illustrations don't quite do these beauties justice. These custom ornaments are handcrafted with 24k gold plated wire outlining the vivid colors of the design. Each ornament comes in a silk covered gift box - perfect for giving and safekeeping. We also have Holiday Bash tickets, LITH embroidered aprons, printed tea towels, private party signs, and the 30th Anniversary t-shirts available for sale on the website. This year the LITH committee, with feedback from residents of Woodland Heights, have selected Byrne and Euclid streets as the official route for the event, with the “anchor” being the Norhill Esplanade. It’s been close to 10 years since these streets have participated and we know that everyone will be excited to see the displays, hear the performers and enjoy the holiday cheer. A larger, print-ready version of the route map is available for download here. As plans are finalized with the city, further details about the route will be published in coming issues of the WHCA newsletter. The Lights in the Heights Committee has been working for more than three months planning for Lights in the Heights events to be held starting in September. Having been on the LITH Committee for that long, I am finding myself humming Christmas Carols and trying to remember all the words to my favorite holiday poem, A Visit from St. Nicholas by Clement Clark Moore. So, I have loosely patterned this on that beloved holiday poem that Moore wrote for his children almost two hundred years ago, in 1822. As their excitement for summer vacation could be heard in the air. Some students were busy in their Intro Graphic Design class, using the Web And Adobe InDesign to create digital images of what danced in their heads. Art Teacher Connie Sulewski, who directs the Graphics Design Program at Hogg, Called for her class’s attention, “A new assignment,” she said with a nod. Seventh-grader, Jacob Gonzales looked around to see what was the matter? “On banners! On letters! On signs and posters! So he could start the assignment quickly, after his dash. But the Lone Star of Texas, something Jacob holds dear. “That’s it! That’s the design they will want!” Jacob said. The words were neon colors, and at the bottom was the date. Jacob submitted his design, so Ms. Sulewski could do her part. 30 excellent designs culled from about 100 submitted. How would they ever choose just one as the best? The Lone Star Holiday Lights design was selected for the 2018 logo! Jacob Gonzales was the winner – a future graphics design pro! The graphic design program at Hogg Middle School offers students comprehensive problem-solving explorations from the conceptual development phase through production of effective design solutions using digital technologies. Graphic design students address concepts of a variety of design problems leading to the execution and evaluation of their solutions, while gaining confidence and proficiency working with digital media. Presented by the Woodland Heights Civic Association. Details to follow by email and at http://www.woodland-heights.org. For more info contact lightsintheheights@gmail.com. Hope to see you at all four events! This past December was the 30th anniversary of Lights in the Heights, a Woodland Heights tradition. This memorable neighborhood event has been made possible by the hard work of volunteers right here in our community. The most recent Chairperson of the Lights in the Heights Committee was Jan Greer, who served from 2015 to 2017. Jan first served on the committee from 2011 to 2014 under the leadership of Terri Guerra, Glen Sementelli, and Tim McConn. During that time she gained experience as Captain of the House Decorating Contest, T-Shirt Captain, and Secretary. Jan has been hard-working, energetic, and eager to help in all of her roles. Committee members recall her loaning personal décor items for the Gala, coordinating with local businesses, responding to countless e-mails and phone calls, and handling difficult situations with grace, even in the last few days before her second child was born! During her years as Chairperson she has worked to maintain the neighborhood and family-centered nature of Lights in the Heights by seeing to operations and logistics and maintaining appropriately-sized attendance. She oversaw three successful fundraising Galas and neighborhood-only Friday Night Lights events. 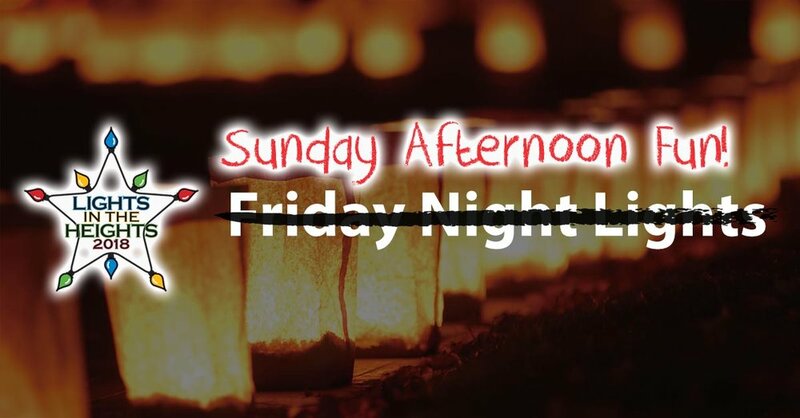 Despite challenges in the aftermath of Hurricane Harvey, Jan and the Committee held a fantastic 30th Lights in the Heights celebration and organized additional neighborhood-only gatherings in the week leading up to the main event. Jan’s passion for the Woodland Heights and willingness to serve is clear, and we are so grateful for her leadership. Thank you, Jan! After serving for three successful years as Chair, Jan has decided to step down for 2018. 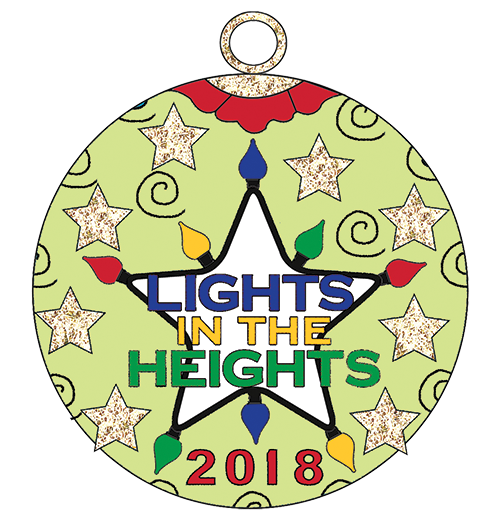 Our very own Beth Allen-Brock and Melissa McKee (with the blessing of the WHCA board) are searching for people willing to serve as Co-Chairs for the Lights in the Heights Committee. This year the plan is to have multiple Co-Chairs to spread the load of the Chair position and welcome more volunteers to the committee. Jan has kindly consented to be a “consultant” for this year to help with the transition and provide valuable history and background on Lights in the Heights. If you are interested in serving as a Co-Chair or in another role, please contact Melissa McKee and Beth Allen-Brock at lith-chair@woodland-heights.org. Neighbors have once again stepped up, decorating in preparation for Lights in the Heights. 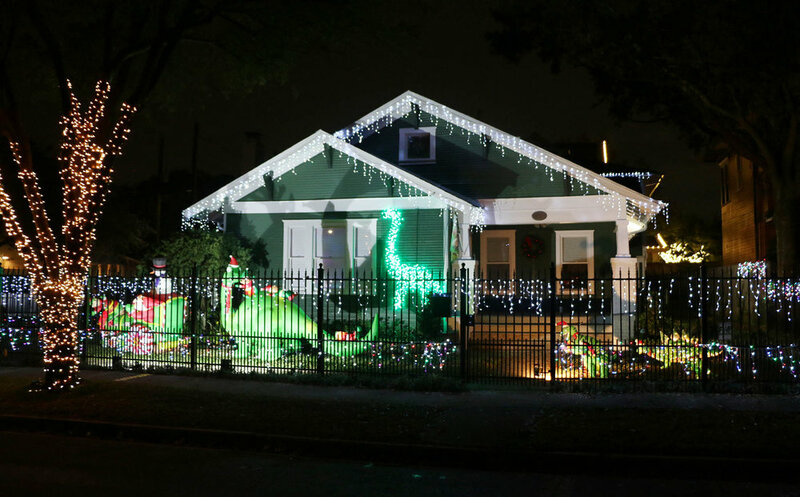 As a result, Woodland Heights has once again appeared on numerous lists of best places to see holiday lights in Houston. The gallery below contains images from all of the winning homes. Judging occurred the evening of Thursday, December 7th, under the direction of Head Judge Robyn Klepper. Clicking on the large image cycles to the next, or navigate using the strip of images below. The following are the judges results. Pictures to follow. As of December 2nd the limited edition Lights-in-the-Heights cloisonné Christmas ornaments are completely sold out! Only 75 were produced. Delivery of the ornaments is expected about a week before Christmas. Once the goods have arrived, Jan Rynda Greer, LITH Committee Chair, will provide pickup details to everyone who purchased an ornament. The latest WHCA newsletter is a LITH Special Edition with all the details about LITH. It has been printed. Distribution by the team of volunteer block captains happened over the past few days. If you didn't receive a copy you can click here to download a color PDF version. Questions or comments about the newsletter can be directed to: communications@woodland-Heights.org.